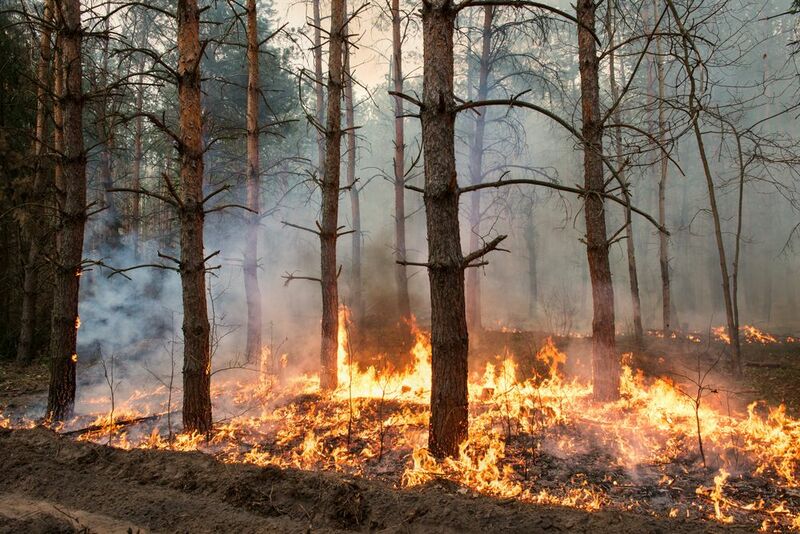 Wildfires are consuming our forests and grasslands faster than we can replace them. It’s a vicious cycle of destruction and inadequate restoration rooted, so to speak, in decades of neglect of the institutions and technologies needed to keep these environments healthy. 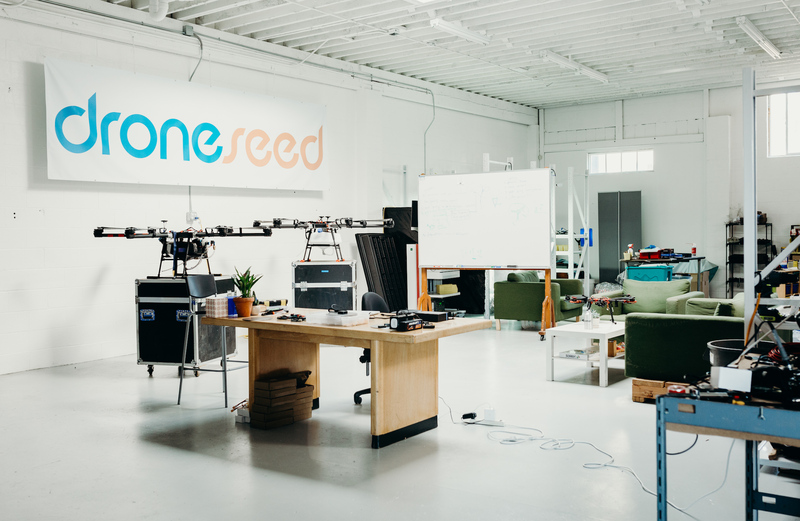 DroneSeed is a Seattle-based startup that aims to combat this growing problem with a modern toolkit that scales: drones, artificial intelligence, and biological engineering. And it’s even more complicated than it sounds. A bit of background first. The problem of disappearing forests is a complex one, but it boils down to a few major factors: climate change, outdated methods, and shrinking budgets (and as you can imagine, all three are related). Forest fires are a natural occurrence, of course. And they’re necessary, as you’ve likely read, to sort of clear the deck for new growth to take hold. But climate change, monoculture growth, population increases, lack of control burns, and other factors have led to these events taking place not just more often, but more extensively and to more permanent effect. On average, the U.S. is losing 7 million acres a year. That’s not easy to replace to begin with — and as budgets for the likes of national and state forest upkeep have shrunk continually over the last half century, there have been fewer and fewer resources with which to combat this trend. The most effective and common reforestation technique for a recently burned woodland is human planters carrying sacks of seedlings and manually selecting and placing them across miles of landscapes. This back-breaking work is rarely done by anyone for more than a year or two, so labor is scarce and turnover is intense. Even if the labor was available on tap, the trees might not be. Seedlings take time to grow in nurseries and a major wildfire might necessitate the purchase and planting of millions of new trees. It’s impossible for nurseries to anticipate this demand, and the risk associated with growing such numbers on speculation is more than many can afford. One missed guess could put the whole operation underwater. At least then, in a year, instead of a weedy wasteland, you have a grassy monoculture — not a forest, but it’ll do until the forest gets here. One final complication: helicopter spraying is a horrendously dangerous profession. These pilots are flying at sub-100-foot elevations, performing high-speed maneuvers so that their sprays reach the very edge of burn zones but they don’t crash head-on into the trees. This is an extremely dangerous occupation: 80 to 100 crashes occur every year in the U.S. alone. In short, there are more and worse fires and we have fewer resources — and dated ones at that — with which to restore forests after them. These are facts anyone in forest ecology and logging are familiar with, but perhaps not as well known among technologists. We do tend to stay in areas with cell coverage. But it turns out that a boost from the cloistered knowledge workers of the tech world — specifically those in the Emerald City — may be exactly what the industry and ecosystem require. So what’s the solution to all this? Automation, right? Automation, especially via robotics, is proverbially suited for jobs that are “dull, dirty, and dangerous.” Restoring a forest is dirty and dangerous to be sure. But dull isn’t quite right. It turns out that the process requires far more intelligence than anyone was willing, it seems, to apply to the problem — with the exception of those planters. That’s changing. Earlier this year, DroneSeed was awarded the first multi-craft, over-55-pounds unmanned aerial vehicle license ever issued by the FAA. Its custom UAV platforms, equipped with multispectral camera arrays, high-end lidar, 6-gallon tanks of herbicide, and proprietary seed dispersal mechanisms have been hired by several major forest management companies, with government entities eyeing the service as well. These drones scout a burned area, mapping it down to as high as centimeter accuracy, including objects and plant species, fumigate it efficiently and autonomously, identify where trees would grow best, then deploy painstakingly designed seed-nutrient packages to those locations. It’s cheaper than people, less wasteful and dangerous than helicopters, and smart enough to scale to national forests currently at risk of permanent damage. I met with the company’s team at their headquarters near Ballard, where complete and half-finished drones sat on top of their cases and the air was thick with capsaicin (we’ll get to that). The idea for the company began when founder and CEO Grant Canary burned through a few sustainable startup ideas after his last company was acquired, and was told, in his despondency, that he might have to just go plant trees. Canary took his friend’s suggestion literally. It may not surprise you to hear that investors are not especially hot on forest restoration (I joked that it was a “growth industry” but really because of the reasons above it’s in dire straits). But investors are interested in automation, machine learning, drones, and especially government contracts. So the pitch took that form. 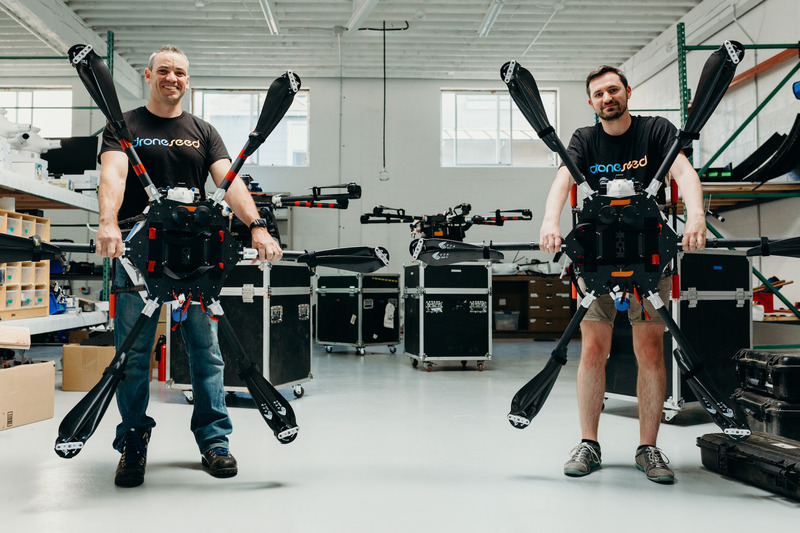 With the money Droneseed secured, it has built its modestly sized but highly accomplished team and produced the prototype drones with which is has captured several significant contracts before even announcing that it exists. The company went through Techstars, and Social Capital helped them get on their feet, with Spero Ventures joining up after the company got some groundwork done. If things go as Droneseed hopes, these drones could be deployed all over the world by trained teams, allowing spraying and planting efforts in nurseries and natural forests to take place exponentially faster and more efficiently than they are today. It’s genuine change-the-world-from-your-garage stuff, which is why this article is so long. The job at hand isn’t simple or even straightforward. Every landscape differs from every other, not just in the shape and size of the area to be treated but the ecology, native species, soil type and acidity, type of fire or logging that cleared it, and so on. So the first and most important task is to gather information. For this Droneseed has a special craft equipped with a sophisticated imaging stack. This first pass is done using waypoints set on satellite imagery. The information collected at this point is really far more detailed than what’s actually needed. The lidar, for instance, collects spatial information at a resolution much beyond what’s needed to understand the shape of the terrain and major obstacles. It produces a 3D map of the vegetation as well as the terrain, allowing the system to identify stumps, roots, bushes, new trees, erosion, and other important features. This works hand in hand with the multispectral camera, which collects imagery not just in the visible bands — useful for identifying things — but also in those outside the human range, which allows for in-depth analysis of the soil and plant life. The resulting map of the area is not just useful for drone navigation, but for the surgical strikes that are necessary to make this kind of drone-based operation worth doing in the first place. No doubt there are researchers who would love to have this data as well. Now, spraying and planting are very different tasks. The first tends to be done indiscriminately using helicopters, and the second by laborers who burn out after a couple years — as mentioned above, it’s incredibly difficult work. The challenge in the first case is to improve efficiency and efficacy, while in the second case is to automate something that requires considerable intelligence. Spraying is in many ways simpler. Identifying invasive plants isn’t easy, exactly, but it can be done with imagery like that the drones are collecting. Having identified patches of a plant to be eliminated, the drones can calculate a path and expend only as much herbicide is necessary to kill them, instead of dumping hundreds of gallons indiscriminately on the entire area. It’s cheaper and more environmentally friendly. Naturally, the opposite approach could be used for distributing fertilizer or some other agent. I’m making it sound easy again. This isn’t a plug and play situation — you can’t buy a DJI drone and hit the “weedkiller” option in its control software. A big part of this operation was the creation not only of the drones themselves, but the infrastructure with which to deploy them. The drones themselves are unique, but not alarmingly so. They’re heavy-duty craft, capable of lifting well over the 57 pounds of payload they carry (the FAA limits them to 115 pounds). “We buy and gut aircraft, then retrofit them,” Canary explained simply. Their head of hardware, would probably like to think there’s a bit more to it than that, but really the problem they’re solving isn’t “make a drone” but “make drones plant trees.” To that end, Canary explained, “the most unique engineering challenge was building a planting module for the drone that functions with the software.” We’ll get to that later. 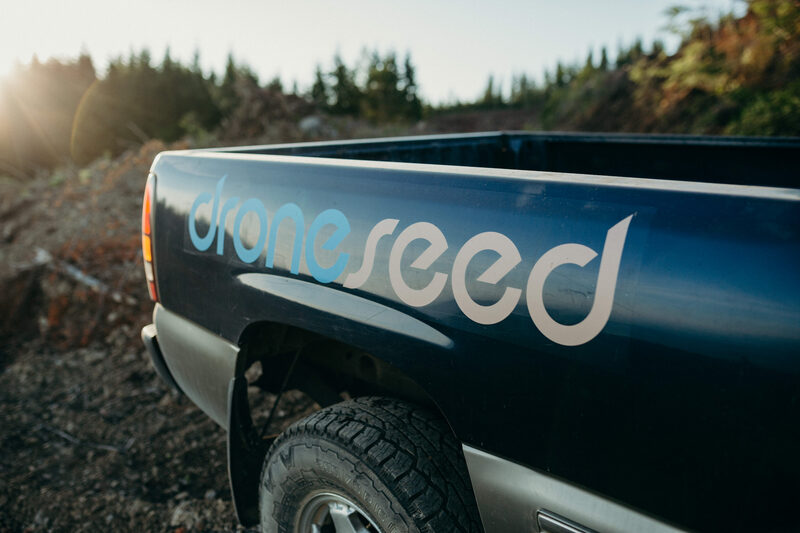 DroneSeed deploys drones in swarms, which means as many as five drones in the air at once — which in turn means they need two trucks and trailers with their boxes, power supplies, ground stations, and so on. The company’s VP of operations comes from a military background where managing multiple aircraft onsite was part of the job, and she’s brought her rigorous command of multi-aircraft environments to the company. The drones take off and fly autonomously, but always under direct observation by the crew. If anything goes wrong, they’re there to take over, though of course there are plenty of autonomous behaviors for what to do in case of, say, a lost positioning signal or bird strike. They fly in patterns calculated ahead of time to be the most efficient, spraying at problem areas when they’re over them, and returning to the ground stations to have power supplies swapped out before returning to the pattern. It’s key to get this process down pat, since efficiency is a major selling point. If a helicopter does it in a day, why shouldn’t a drone swarm? It would be sad if they had to truck the craft back to a hangar and recharge them every hour or two. It also increases logistics costs like gas and lodging if it takes more time and driving. This means the team involves several people as well as several drones. 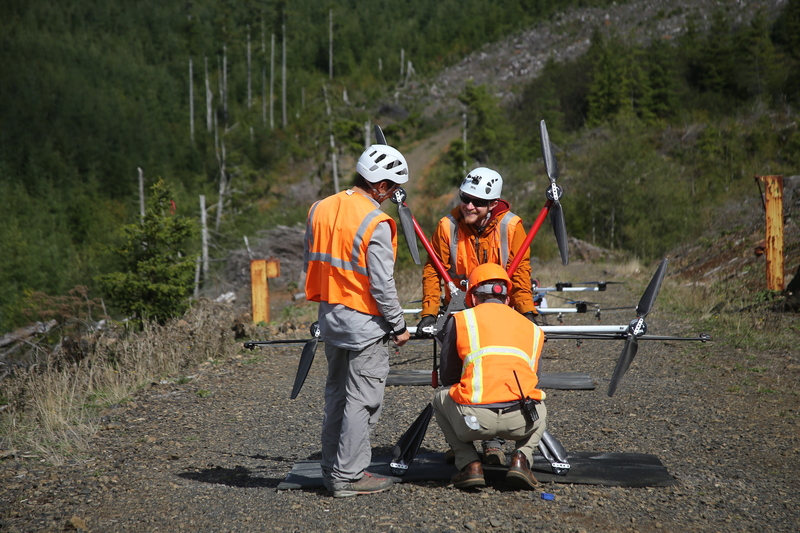 Qualified pilots and observers are needed, as well as people familiar with the hardware and software that can maintain and troubleshoot on site — usually with no cell signal or other support. Like many other forms of automation, this one brings its own new job opportunities to the table. The actual planting process is deceptively complex. The idea of loading up a drone with seeds and setting it free on a blasted landscape is easy enough to picture. Hell, it’s been done. There are efforts going back decades to essentially load seeds or seedlings into guns and fire them out into the landscape at speeds high enough to bury them in the dirt: in theory this combines the benefits of manual planting with the scale of carpeting the place with seeds. But whether it was slapdash placement or the shock of being fired out of a seed gun, this approach never seemed to work. Forestry researchers have shown the effectiveness of finding the right “microsite” for a seed or seedling; in fact, it’s why manual planting works as well as it does. Trained humans find perfect spots to put seedlings: in the lee of a log; near but not too near the edge of a stream; on the flattest part of a slope, and so on. If you really want a forest to grow, you need optimal placement, perfect conditions, and preventative surgical strikes with pesticides. Although it’s difficult it’s also the kind of thing that a machine learning model can become good at. Sorting through messy, complex imagery and finding local minima and maxima is a specialty of today’s ML systems, and the aerial imagery from the drones is rich in relevant data. The company’s CTO led the creation of an ML model that determines the best locations to put trees at a site — though this task can be highly variable depending on the needs of the forest. A logging company might want a tree every couple feet even if that means putting them in sub-optimal conditions — but a few inches to the left or right may make all the difference. On the other hand, national forests may want more sparse deployments or specific species in certain locations to curb erosion or establish sustainable firebreaks. Once the data has been crunched, the map is loaded into the drones’ hive mind and the convoy goes to the location, where the craft are loaded up with seeds instead of herbicides. But not just any old seeds! You see, that’s one more wrinkle. If you just throw a sagebrush seed on the ground, even if it’s in the best spot in the world, it could easily be snatched up by an animal, roll or wash down to a nearby crevasse, or simply fail to find the right nutrients in time despite the planter’s best efforts. That’s why DroneSeed’s Head of Planting and his team have been working on a proprietary seed packet that they were unbelievably reticent to detail. From what I could gather, they’ve put a ton of work into packaging the seeds into nutrient-packed little pucks held together with a biodegradable fiber. The outside is dusted with capsaicin, the chemical that makes spicy food spicy (and also what makes bear spray do what it does). If they hadn’t told me, I might have guessed, since the workshop area was hazy with it, leading us all to cough tear up a little. If I were a marmot, I’d learn to avoid these things real fast. The pucks, or “seed vessels,” can and must be customized for the location and purpose — you have to match the content and acidity of the soil, things like that. DroneSeed will have to make millions of these things, but it doesn’t plan to be the manufacturer. Finally these pucks are loaded in a special puck-dispenser which, closely coordinating with the drone, spits one out at the exact moment and speed needed to put it within a few centimeters of the microsite. All these factors should improve the survival rate of seedlings substantially. That means that the company’s methods will not only be more efficient, but more effective. Reforestation is a numbers game played at scale, and even slight improvements — and DroneSeed is promising more than that — are measured in square miles and millions of tons of biomass. DroneSeed has already signed several big contracts for spraying, and planting is next. Unfortunately the timing on their side meant they missed this year’s planting season, though by doing a few small sites and showing off the results, they’ll be in pole position for next year. After demonstrating the effectiveness of the planting technique, the company expects to expand its business substantially. That’s the scaling part — again, not easy, but easier than hiring another couple thousand planters every year. 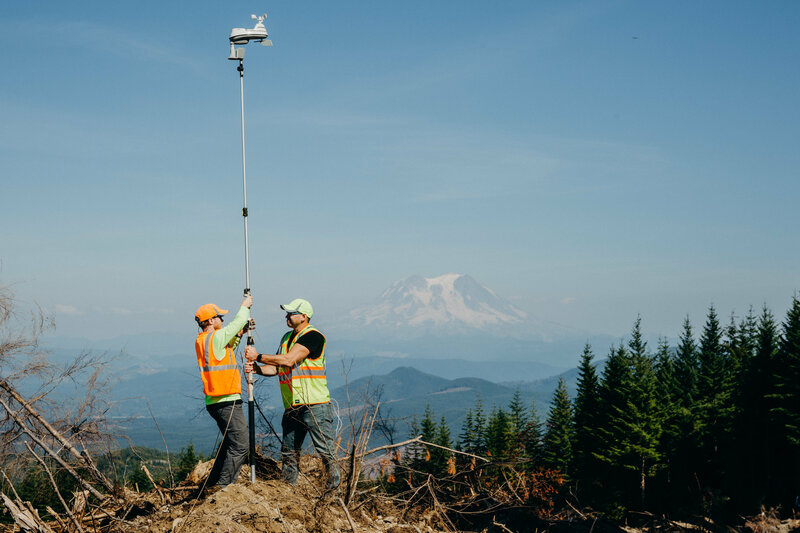 Ideally the hardware can be assigned to local teams that do the on-site work, producing loci of activity around major forests from which jobs can be deployed at large or small scales. A set of 5 or 6 drones does the work of a helicopter, roughly speaking, so depending on the volume requested by a company or forestry organization you may need dozens on demand. That’s all yet to be explored, but DroneSeed is confident that the industry will see the writing on the wall when it comes to the old methods, and identify them as a solution that fits the future. If it sounds like I’m cheerleading for this company, that’s because I am. It’s not often in the world of tech startups that you find a group of people not just attempting to solve a serious problem — it’s common enough to find companies hitting this or that issue — but who have spent the time, gathered the expertise, and really done the dirty, boots-on-the-ground work that needs to happen so it goes from great idea to real company. That’s what I felt was the case with DroneSeed, and here’s hoping their work pays off — for their sake, sure, but mainly for ours.